At age 86, Davis Bynum the man has become an eponymous wine brand that will most likely outlive him. Not only that, the nation's biggest wine brand in retail sales was named after his feet. 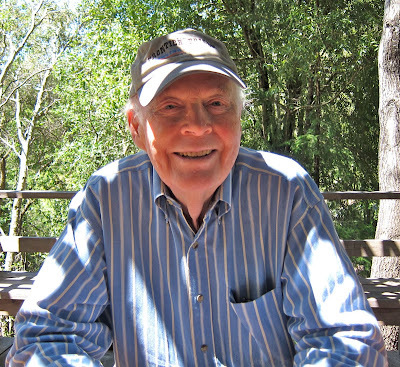 I met him on a warm summer day for sandwiches, a bottle of Thomas George Sauvignon Blanc, and some stories about what it was like to sell California Pinot Noir in the 1970s. Jeremy Baker, who owns and manages Thomas George, warned me that Bynum is slowing down and that our conversation might be short. But once Bynum got to telling stories, he didn't stop for two hours. Here are a few. "I was in the infantry in World War II. I went in in 1943. They sent me to UCLA for nine months to study engineering. I think when they found out how stupid most of us were they realized it was a bad idea to convert an English major into engineering. They folded the outfit and I went into the mortar outfit." Why aren't there more sparkling wine producers? Taxes. California had 2,347 wineries in 2009. How many of those make sparkling wine? I think I can count them on my fingers. There have been new big-money investments all over the state. Napa Valley no longer has the franchise, or even the lead, on $20 million winery projects. But is there a new Schramsberg, Domaine Carneros or J? Not that I know of. You might think the reason for this is that Americans still don't drink enough sparkling wine. It accounted for only 4.6% of U.S. wine sales in 2010, according to the Gomberg-Fredrikson Report. But are 4.6% of the wineries in this country bubbly makers? Are there 100 sparkling wine producers in Calfornia? I wish. Moreover, the category is booming, as 2010 sales were up 10% over the previous year. Maybe all those years of telling Americans that bubbly is great any day with any meal -- or by itself -- are finally paying off. But are any of the major wine companies -- Constellation, Gallo, the Wine Group, Bronco -- pouncing in to capitalize? Not that I'm aware of. Everybody's into slightly fizzy Muscat; a bottle of Yellow Tail Muscat arrived at my door last week, which means the Muscat boom is about to hit a backlash. But traditional-method bubbly remains the province of a handful of players. This is stunning when you think about the number of newbie fools optimists who think they're going to make their living on Syrah. In fact, I can name more new wineries making Ribolla Gialla than I can those making sparkling wine. There's a hidden reason that savvy businessmen like the Wine Group know, but the rest of us wouldn't consider: taxes. 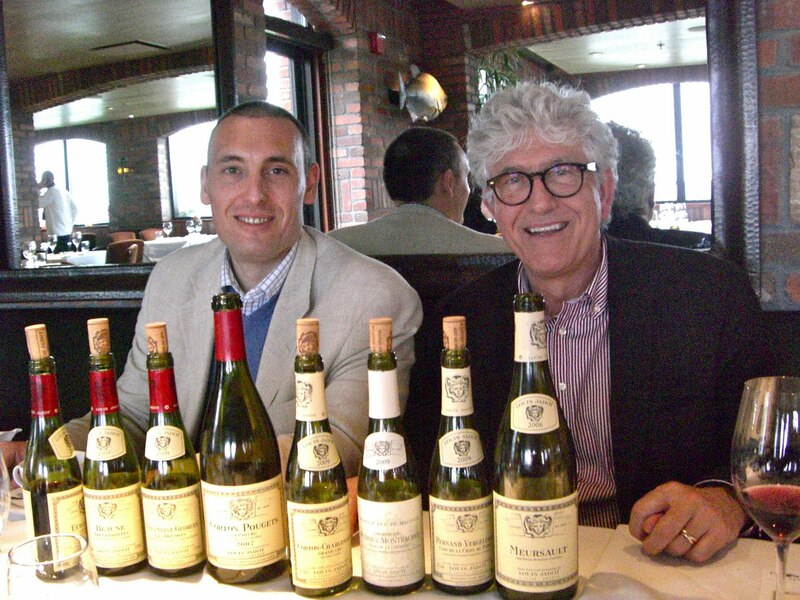 Louis Jadot "accepts the vintage"
My most recent column at Wine Review Online sprung from a single sentence, one I have been repeating (mostly in disbelief) ever since I heard it: "We accept the conditions of the vintage." What that means is the head winemaker at Louis Jadot, Jacques Lardiere, would rather make a lesser wine that's true to the vintage conditions than change the house style and make a wine that might taste better. It's a remarkable philosophy -- perhaps the crux of Burgundy -- and unimaginable in California, and I invite you to visit Wine Review Online to read what else he says about it. Lardiere brought some 2009 barrel samples with him that Louis Jadot expects to release at the end of the year. It's hard to evaluate barrel samples in France, let alone when they have been abruptly bottled and flown halfway around the globe. I won't rate them, but I'll give you an idea of what they tasted like when I tried them. To understand the New York Times story on Congressman Mike Thompson (D-St. Helena) that ran Monday, you don't need to look further than the first quote. The story is a classic political piece in which one side of a dispute uses a gullible newspaper to weaken the other side. The article does expose one thing Thompson shouldn't be doing, and I'll get to that. The writer ignores an obvious area for investigation -- a real smoking gun -- and I'll get to that too. What the article misses is perspective on Thompson's role in advocating for wine producers in Congress. He's not doing it because he owns a vineyard; he's doing it because it's his job, and he would be voted out of office if he didn't. Moreover, the reason we as a society don't like government officials investing in the industries they govern is because we fear they will promote their own interests at the expense of the public. But unlike with other industries, by helping wine producers, Thompson helps consumers.